We’d love your help. Let us know what’s wrong with this preview of I Had a Black Dog by Matthew Johnstone. To ask other readers questions about I Had a Black Dog, please sign up. 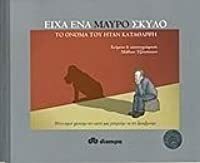 A well illustrated and insightful book about the 'Black Dog' [Depression]. It is very well pointed out that one's 'Black Dog' is something that is happening to oneself rather than the 'real self'. This, for sure, helps to think about depression in a constructive manner. As the author mentions, it is required to 'let out' the Black Dog as often as possible. It may not be possible to let go of depression, but we need to reali "If you find yourself going through hell, keep going." As the author mentions, it is required to 'let out' the Black Dog as often as possible. It may not be possible to let go of depression, but we need to realize that the Black Dog days shall and will pass. To be honest, I got this book from my library's biography section - initially I just thought it was some sort of graphic biography, but the title does of course refer to Churchill's black dog...as he called his bouts of depression. In fact the whole book is about the experience of depression. But, before you turn away - it is the most user-friendly (and surprisingly delightful) book that I have ever seen on the subject. Whether you are an outsider who's had friends who have suffered with depressi To be honest, I got this book from my library's biography section - initially I just thought it was some sort of graphic biography, but the title does of course refer to Churchill's black dog...as he called his bouts of depression. In fact the whole book is about the experience of depression. But, before you turn away - it is the most user-friendly (and surprisingly delightful) book that I have ever seen on the subject. Whether you are an outsider who's had friends who have suffered with depression, or if you have been mired in this horrible illness yourself - this book is a great read. It is written with such understanding and kindness. It's deceptively simple. There are a few words incorporated with the pix, and they complement them perfectly - each picture comes to life - rich with insight and compassion. The end of the book gently suggests some ways forward - the reader doesn't just end up in the middle of a description about depression. There is hope too. Black Dog has come to be a metaphor to many people for Depression. There are many myths about a black dog that visits before death. Neil Gaiman wrote one. I wanted to read this but the only copy I could get here is in Polish, so I had to get each line translated. That is commitment, right? But in the process of doing this, I found the book translated in a YouTube video, narrated by the author, so you can have it read to you here. 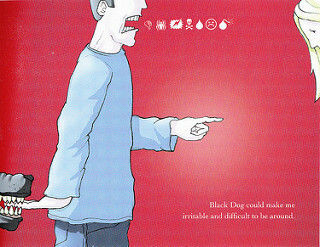 Millions of people have seen it, sponsored by the World Health Orga Black Dog has come to be a metaphor to many people for Depression. There are many myths about a black dog that visits before death. Neil Gaiman wrote one. It's a memoir comic (though it looks like a smallish picture book or illustrated book) that elegantly depicts various relations Matthew has with The Black Dog, or depression. It's powerful and moving and insightful in all the metaphors it has for how depression can impact you, the dog sits on your chest, it sleeps between you and your wife, it sits on the table while you eat (ruining your appetite), at some points living inside of you, completely controlling you. This book is helpful whether you know someone with depression or are living it. I do not typically suffer from depression but I have a son who is experiencing it with increasing severity. Doesn't everyone know someone with severe depression? Czarny Pies is Polish for Black Dog, which has come to mean for many people Depression. It's a memoir comic (though it looks like a smallish picture book or illustrated book) that elegantly depicts various relations Matthe Czarny Pies is Polish for Black Dog, which has come to mean for many people Depression. 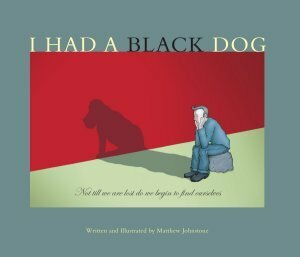 It's a memoir comic (though it looks like a smallish picture book or illustrated book) that elegantly depicts various relations Matthew has with The Black Dog, or depression. It's powerful and moving and helpful whether you know someone with depression or are living it. I do not typically suffer from depression but I have a son who is experiencing it with increasing severity. Doesn't everyone know someone with severe depression? If you know someone or have suffered yourself with some form of mental health, then you need to read this book. It is incredibly short and has probably less than 200 words in the whole thing. And yet it perfectly encapsulates what life with depression is really like. This is poignant and hard-hitting but a necessary read. I identified with it so much and the mixture of text and illustration helped me to truly visualize my own demons. There is a Youtube video to go along with the book, and it can If you know someone or have suffered yourself with some form of mental health, then you need to read this book. It is incredibly short and has probably less than 200 words in the whole thing. And yet it perfectly encapsulates what life with depression is really like. This is poignant and hard-hitting but a necessary read. I identified with it so much and the mixture of text and illustration helped me to truly visualize my own demons. 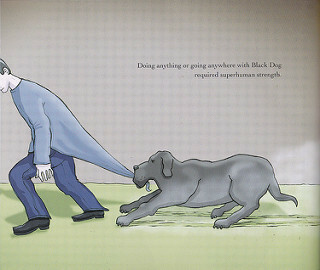 Winston Churchill's black dog euphemism for depression is given form by author and illustrator Matthew Johnstone. He skillfully reveals his personal navigation through the seven hells of depression to the light at the end of the very long tunnel. As Churchill once said, "if you're going through hell, keep going." Johnstone sought treatment, told his family and friends and learned how to control the dreaded beast so he could finally enjoy life again. 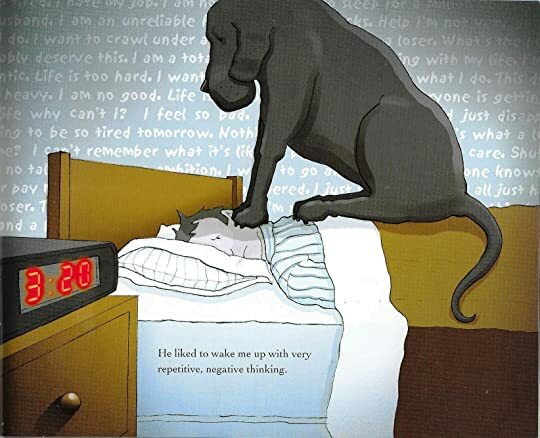 While I do believe this picture book is accessi Winston Churchill's black dog euphemism for depression is given form by author and illustrator Matthew Johnstone. He skillfully reveals his personal navigation through the seven hells of depression to the light at the end of the very long tunnel. As Churchill once said, "if you're going through hell, keep going." Johnstone sought treatment, told his family and friends and learned how to control the dreaded beast so he could finally enjoy life again. While I do believe this picture book is accessible to all - including children - with its simple language and warm illustrations, its impact on me was . . . not what I expected. We're more informed and accepting of depression now than we were when I Had a Black Dog was first published in 2005. Ten years is a long time culturally. I know that had I read this back then, I'd be giving it a standing ovation for its accurate depiction of the most common mental illness. The above page represents one of the aspects I struggled with for years. Every month, as part of my PMS symptoms, I suffered with cripplingly low self-esteem. Every memory from the minor slip ups to bigger mistakes I thought I'd made in my life would cycle through my mind. It was mental torture. Paranoia was one of the side effects, sometimes so terrible I had to leave work before I had a spectacular meltdown. Which leads on to The Fear. The Fear that everyone will find out and judge you. Because of the shame and stigma associated with Black Dog. I became a champion at fooling everyone, both at home and at work. Keeping up an emotional lie takes an incredible amount of energy. It's like trying to cover up epilepsy, a heart attach, or diabetes. Although today we're more open and understanding about depression, there's still room for improvement. To those who argue the 'black dog' isn't real, the foreword - written by a professor of clinical psychology and head of mental health for Derbyshire - explains the biological basis for the condition reflected in structural and chemical changes in the brain. Clearly and simply presented, Johnstone shares his experience of depression (his "Black Dog") with dignity, self-awareness and, most importantly, self-acceptance. His illustrations allow him to convey the melancholy enervation of depression using relatively few words, but still communicating a deep empathy. It's a book that takes just a few minutes to deliver its powerful, humane message. Highly recommended if you're struggling to articulate your own experience - it should help others who don't e Clearly and simply presented, Johnstone shares his experience of depression (his "Black Dog") with dignity, self-awareness and, most importantly, self-acceptance. His illustrations allow him to convey the melancholy enervation of depression using relatively few words, but still communicating a deep empathy. It's a book that takes just a few minutes to deliver its powerful, humane message. After wading unsuccessfully through self-help books, I came across a few good reviews of this book and decided to give it a try. I've never really understood why depression is referred to as the 'black dog' as it seems to give the impression that it is something entirely seperate from yourself. Although this might be the opinion of an observer, it can feel almost impossible to distinguish between the illness and your own personality when in the depths of depression. Despite this, I absolutely lov After wading unsuccessfully through self-help books, I came across a few good reviews of this book and decided to give it a try. Despite this, I absolutely loved this book. In 200 words it completely explained what an entire self-help section of a bookshop could not: what it feels like to have depression. The cartoons, although simple, were also hugely meaningful, and detailed enough to require few words. Although every picture illustrates a different aspect of depression, there was one particular page that really struck a chord. The caption reads 'activities that usually brought me pleasure suddenly ceased to', with an illustration of the man trying to fly a kite, but failing because the dog is sitting on the string. I started crying somewhat hysterically at that point, because I have never seen anything that so simply and beautifully represents the frustration of trying desperately to lift your spirits with an activity that you once loved, but being unable to gain any pleasure from it whatsoever. This is probably the best visualisation of depression I've seen. It makes it easy for people who don't understand the illness to understand. Heraclitus said that War is the Father of All things. He was right in more ways than one. Winston Churchill coined the phrase "black dog" ; I came across it in one of my history books. If things that you used to enjoy become meaningless... decide whether your interest is not dependent upon the approval of others.... It usually is not. You own it! If you feel like sitting at home pitiful, sad and alone.... go to the gym or have a conversation. Two life strategies I've applied from this book. Now Heraclitus said that War is the Father of All things. He was right in more ways than one. Winston Churchill coined the phrase "black dog" ; I came across it in one of my history books. Winston Churchill famously compared his depression to a black dog. (Which is, if you think about it, rather unfair to black dogs.) This simple, illustrated book talks about one of the most common mental illnesses in a way that will be instantly familiar to those who suffer from it and will be a very basic primer for those who do not. The illustration choices were quite clever, such as the man who sees everything through black dog-shaped glasses and the idea that each sufferer has his or her own u Winston Churchill famously compared his depression to a black dog. (Which is, if you think about it, rather unfair to black dogs.) 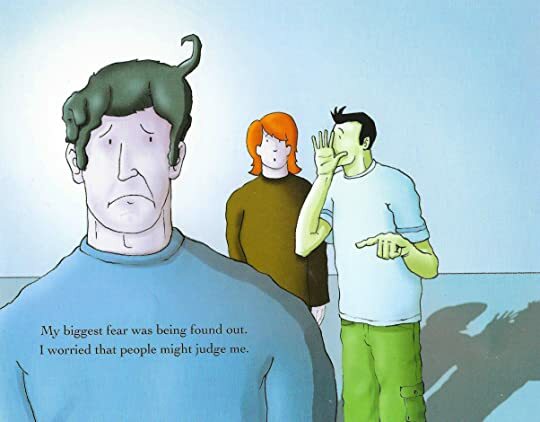 This simple, illustrated book talks about one of the most common mental illnesses in a way that will be instantly familiar to those who suffer from it and will be a very basic primer for those who do not. A super powerful and accurate visualisation of depression and its side effects, definitely recommended for anyone having trouble understanding what this illness is all about and how it truly feels like. This may be one of the shortest books I've ever read, but it's also probably one of the most important. The things that I just haven't been able to put into words are expressed perfectly here and, for the first time, I feel that others, family and friends for example, could grasp it if they read the book too. Importantly, the book has made me feel that it may be possible to take control of the Black Dog. Brilliant book-everyone should read it. I try and get people to read this, its so short it shouldn't come across as an imposition, and its cartoons convey things that are so hard to put into words. I pass it to people who are depressed so that they realise that others feel this way too, they are not alone, and I pass it to people who I want to understand where I am coming from. This book says as much about depression in 200 words as other books take 200+ pages to say. A must-read for anyone who may come across depression, so everyone! It should be made available to everyone by being stocked in all libraries, especially school libraries. It would even be a great addition to the school curriculum! Waarschijnlijk heb ik het weer verkeerd begrepen maar dit doet me eerder denken aan een brochure over depressie waarbij de symptomen en remedies van depressie als een metafoor door een zwarte hond worden weergegeven. Leuk gevonden misschien (alhoewel de term Black Dog voor depressie niet door Johnstone werd gevonden) maar als boek stelt het weinig voor en leert het mij totaal niets. Zelfs de tekeningen vind ik nogal simpel. This is a short book depicting depression in a visual way. I can image it could be a good starting point for those suffering with depressing to see that they are not alone or for those who have friends with depressions to start getting an understanding of what their friend is going through. A well put together book. An excellent and very accessable exploration of the metaphor. My Mum recommended this book to me after a discussion about depression, and I'm so glad she did. The book thoroughly describes how I feel when I'm depressed, and although I've never suffered from extremely long periods of depression, they've been long enough to be able to see myself in this book. Depression comes in different strengths, but even a mild occasional type can be distressing, and a lot of the difficulty with depression is the effort to hide it. To carry on regardless. To explain the unexplainable. But this little picture book does explain. While suffering from severe depression I had doctors recomend several books to me that might help, this was better than all of them. Short and simple so that it can be easily grasped even when your brain doesn't seem to be working properly. I like how it uses Black Dog to describe depression. The way it's written is good, not condescending or 'dumbed down' but uses simple language to describe all the dark and down feelings and situations. Its very real. Probably the most important book I've ever read in my life. Should be compulsory for everyone to read this. For what this is, this is utterly brilliant! Simple, comprehensive, and easy to relate to! I just cried my way through this book. A very accurate visualisation of what it feels like to suffer with depression. It's increadbly difficult to put your own feelings of depression and what it means to you into words, however Matthew does that so well. moreover I really enjoyed how he showed that depression not only didn't just go away but also how difficult it is to manage it. unlike the normal self help book where it tells you to just meditate and do some yoga then you'll be fine. This book was a quick read because there is barely any writing, but I decided to read this because it was in my library and I was interested. This book is about depression ( which I wasn’t expecting ) and how it affects the author. This was a great read if you want to know more about the ways depression is shown through literature. It’s not jam packed full of information and is so easy to read. I recommend! Matthew Johnstone is a passionate mental health and wellbeing advocate. He's an author, illustrator, photographer, public speaker and is also the creative director at the Black Dog Institute. He lives in Sydney Australia with his wife and two daughters.